Alan Arnette speaks with Dave Hahn, Everest guide and 15 times summiter. Great interview. With only six months to go before climbers head to Nepal and Tibet for the annual spring climb of Mt. Everest, Dave Hahn, 15 times summiter, was kind enough to share his thoughts on the state of Everest and his own personal plans for guiding. One reason I wanted to catch up with Dave, was his comment in interviews earlier this year that he would stop leading Everest expeditions and instead offer private guidance on the mountain. I’ve known him for over 10 years and wondered if this was a reflection on the state of Everest or a personal life choice for him. After all, Dave has more summits, at 15, than any foreigner; in other words only 12 Sherpas have more summits than Dave thru 2015. Dave’s experience in the mountains is one many aspire to, but few can claim. He has been a guide for Rainier Mountaineering Inc. (RMI) for 31 years. His summits are impressive: 275+ on Rainier, 35 on Vinson, 22 summits of Denali out of 32 attempts and Cho Oyu and Aconcagua plus others. Also he loves to guide the Shackleton Crossing on South Georgia Island. He is certainly an accomplished climber but also an impressive writer providing some of the most insightful dispatches from any climb. My last interview with Dave was in 2010 so I was lucky to catch him at home in Taos where he is a professional ski patroller at Taos Ski Valley since 1985. AA: Everest seems to be the mountain the world loves to hate! It feels like there is rarely positive coverage even in the outdoor oriented media. Why is that? DH: Elite climbers are often offended that Everest takes up an outsized chunk of the public’s interest in climbing. They point out -correctly- that what goes on each spring on Everest does not represent the cutting edge of what is possible in alpinism. Journalists pick up on this disdain and amplify it, but of course, they do that while using the mountain to sell magazines and generate clicks. It is easy to vilify the clientele on commercial Everest trips since they are often paying a lot of money (hence they are “rich” while the workers are poor)… Their summit ambitions can be put down to trophy hunting, as opposed to whatever true and virtuous calling “real” climbers are answering. And yes, some climbers go to Everest before they have “proper” experience for it. The public can be forgiven for believing that every modern Everest climber is hell bent on promoting themselves while destroying the environment, exploiting workers and exceeding their own abilities. Some are… most aren’t, but their stories are less compelling. AA: Over the past few years, Everest has seen several large scale natural disasters with serac releases onto the Icefall killing Sherpas and last year’s earthquake with tragedy at Basecamp and throughout Nepal. What impact has this had on your view of guiding Everest? DH: In the broader picture, it hasn’t changed my overall view of guiding Everest. I still defend the “industry” -as we’ve taken to calling it. I still think that guiding Everest can be a noble profession. I still think that it can be done without exploiting the workers. I still think it is a beautiful mountain with a rich history and that we can be there -and work there- without doing great harm to the environment or great insult to the traditions and pioneers of mountaineering. But I also think… as I always did… that it is a dangerous and deadly environment. Those seeking to climb the mountain need to be aware of the potential costs -which could involve a great deal more than simply the price of admission. The disasters of 2014 and 2015 can be labeled extraordinary circumstances, but I’d suggest that extraordinary circumstances occur with alarming frequency on the flanks of the biggest mountains on Earth… the difference in these years is that so many people are on the mountain and living at basecamp that what might have been a near miss in decades past has a far better chance of being a flat out disaster now. AA: The Nepal Government seems to struggle with managing Everest. What one or two areas do you think they should focus on to improve safety? DH: The sheer number of climbers on the mountain is the biggest problem. I’d love to see the Nepalese government limit overall numbers and team size. 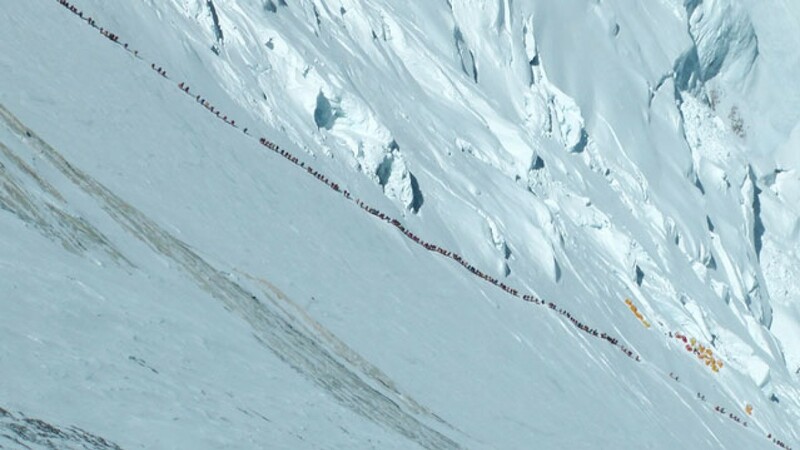 Those Lhotse Face “conga-line” photos that horrified everybody a few years back could have been portraying just two or three of the major operators on the move on the same day. The present permitting system means that some teams could easily employ seventy-five sherpas or more. Seventy-five guys moving all at once with heavy loads is a rather extraordinary challenge for anyone else to work around on the route. I’m not optimistic though that they will limit the overall numbers. Nepal needs the revenue. I do think the government is aware of the need to take better care of the Icefall Doctors and to put more into their training and I see that as a positive sign. AA: Since 2000, there have been between 5 and 12 clients die on Everest – total on both sides. Any thoughts on how those deaths can be reduced that don’t include new rules or massive overhaul of how Everest is managed by Nepal? DH: Let’s suppose for a moment that it was actually possible to go for those massive changes and add a bunch of new regulations and oversight… sadly, people will still die on Mount Everest. Guides will die, clients will die, Sherpas and other Nepalis working on and around the mountain will still die. It is a difficult environment and some accidents and incidents will always occur. In regards to “preventable” deaths… Well, yes, in theory, perhaps you could get guides and clients and all staff educated to the point that such tragedies would no longer occur. But in the real world, there will always be new guides and new clients and new mountain workers who have to learn from hard experience to be conservative and careful. Learn from the mistakes that others have made, but don’t get too high and mighty about pointing fingers and assigning blame, since, quite obviously, even old veteran guides can still get their priorities screwed up at 28,000 ft.
AA: Recently some Nepali based and Sherpa owned guide companies have had teams with well over 75 members and the same number of Sherpa support. They have offered a climb from the Nepal side for as little as $18K. What advice would you give someone considering joining such a team primarily based on the low price? DH: When someone charges a ton for a guided climb, that doesn’t guarantee that it will be a quality experience, and likewise, when someone charges a ridiculously low price, it doesn’t guarantee that the trip will be a disaster. In either case… let the buyer beware. In this day and age, any reputable -or disreputable- operator has a track record that is easily discoverable. Do your homework. I remind people to consider the style in which they’ve undertaken their other ascents around the world. If all you needed on Denali or Aconcagua was a permit and someone getting you to the hill, perfect… that low-priced option may work well for you on Everest. But if you needed guidance and leadership and tents and radios and access to medical care and the possibility of rescue… that might cost more. AA: You have summited from both the north and south sides of Everest. There are some guides saying it is irresponsible to guide clients from the South due to the danger in the Icefall. What is your view? DH: Both sides of the mountain present quite different challenges to guiding. The North side summit day is a tougher one to manage for guiding a group, in my opinion. Particularly if it gets crowded. It is a series of choke points and traverses that are extremely difficult to reverse if someone gets sick or hurt. It can be very difficult to get rid of altitude (go lower)-which is normally essential to start solving health challenges. North side political problems in recent years shouldn’t be ignored either… the permitting can’t always be counted on in advance since the Chinese have put their obvious priority on “managing” Tibet away from the prying eyes of foreigners. The Southside danger and difficulty of the Icefall is well-documented, but perhaps it isn’t always appreciated that the climbers who master the Icefall are ultimately better skilled for taking on the difficulties up high on the Southern route. I think that individual guides may have good reasons for choosing either the North or South sides to work on. When those guides make public pronouncements as to why their own choice is the only responsible course of action… it should be viewed less as a public service and more as old fashioned self promotion. AA: Over the past few years, Everest has become very crowded with people having little experience. How has this factored into your guiding plans? DH: I know that a lot of people focus on the problem of marginally qualified climbers on Everest, but I’d say that the greater troubles involve sheer numbers. As an expedition leader, my concerns were much more about how many other teams, with their associated Sherpa support, were on the mountain. AA: Over the years you were often one of the last parties to summit Everest. Was this by design to avoid the crowds or just the way things worked out? DH: It was by design, for several reasons. While it is far more convenient for guides and guide companies to get Everest wrapped up in early May, the mountain can be a lot tougher for “normal” folks when it is bitterly cold, the route isn’t well-established and there are too many people going high all at once. So I was often waiting for better -easier- conditions and for the crowd to thin out. That strategy wasn’t always working anymore… the spring season was getting so busy that the crowd was no-longer thinning out. AA: Do you believe Nepal should limit the number of permits, similar to the system on Denali. And/or place an experience requirements for all climbers? And finally, certify all guides as to experience, medical training and climbing skills? DH: All of these limitations and requirements are fiendishly difficult to implement and enforce. No offense to the good people trying to govern Nepal, but I’m not sure they are up to this. They need the revenue, so it is unlikely that they will turn away aspiring climbers or guides. And again, with respect, they’ve got far more profound problems to solve in the rest of Nepal. WE have the luxury of fixating on Everest… they do not. AA: A growing trend is to summit the 8000 meter mountains as quickly as possible. Some are suggesting that by acclimatizing at home in altitude tents, Everest can be summited in under three weeks, home to home. What are your thoughts on this approach? DH: I think it is often important to separate fashions and trends in personal climbing with those in guided climbing. While I’ve been envious of those folks who have swept in and out in such short periods of time, they are usually trying for different goals than I am. Most normal folks need the benefit of a little more time to try an 8000 meter peak. They often need time to suffer through a bout of gut illness or a sore throat without it torpedoing their trip. If the idea is to just guide accomplished athletes who come in with superb conditioning and don’t get sick -well, I have had some experience with that too… pretty cool. But I think the bulk of guiding will always be done with “normal” folks… and I’m ok with that. I see nothing inherently wrong with pre-acclimatizing for Himalayan trips. I worry though about people searching for magic solutions that might promise to make big-mountain climbing comfortable and convenient. Good luck. AA: This spring, 2016, was the first time you were not in the Himalaya in almost 20 years. You were quoted as saying that you “only want to do private guiding for select clients who are willing to pay a premium” What is the background on this decision? DH: When stated that way, it sounds a little elitist… and I don’t mean it that way. I guess I like it better if we call it one-on-one guiding, since a preference for “private clients” sounds like it is all about the money. Being an expedition leader on Everest was a great and worthy challenge… and while I’m not so arrogant as to believe that I always got it just right, I’m satisfied that I worked that challenge long enough and hard enough. I’ve never been big on the logistics and planning of Everest expeditions. It has always been the actual guiding on the mountain that interested me. My last seasons of trying to lead groups on Everest were obviously quite difficult (in 2014 and 2015). The burdens of leadership were magnified. The rewards were slim or non-existent. Everest leaders like to feel in control… and I wasn’t feeling that way. I gave it some thought and decided that if I were to work on the mountain again, I’d narrow my focus and concentrate on the guiding… specifically guiding one well-qualified and motivated person at a time. AA: Will you still guide for RMI or only on one-on-one climbs? And you said you only wanted to guide at a “premium price”. What is that price? DH: I’d still be guiding for RMI but I’d narrow my focus to a single client and I’d leave the leadership of the overall team to my fellow RMI guides. I don’t know what the actual figure would be. That may sound silly, but the only specifics I gave RMI on it were the amount that I personally needed to make out of such a trip and the style I wanted to do it in… by which I meant that I didn’t want to be on the mountain on any effort that was hurting for resources or staffing. Suffice to say that someone looking to hire me for what would be my 22nd Everest expedition would be paying at the upper end of the guided scale. AA: Given your earlier comments on the motivations of the “trophy hunting” climber, what is the profile of an Everest climber that you prefer to lead? DH: That was me poking fun at the discomfort others might feel in regards to peak-bagging climbers, collecting summits. I don’t actually have a problem with trophy hunting mountain climbers. People are entitled to their own motivations for climbing mountains. Best not to judge. Like most guides, my ideal client/partner would be the one who shows up in the absolute best shape of his or her life, having studied the mountain and its human history, and ready for a true adventure with an uncertain outcome. AA: Last question. Will you be on Everest in 2017? DH: Tough to say. I’m a creature of habit -I went on twenty-four 8000 meter expeditions in 25 years. Everest means a lot to me and I care very much for the people I worked with on the mountain. But I just turned 55… there are younger, smarter, better-looking guides hard at work on Everest and perhaps I should leave it to them. These interviews take a lot of time to get right. By right I mean to be clear in the questions and answers, tune for the nuance as well as any message. Dave was fun to work with and, as always, an inspiration for being direct, no-nonsense and willing to talk candidly about the industry in a way I rarely find amongst professional mountain guides. If you get a chance to climb with Dave on Rainier, Denali, Vinson or even Everest – jump at it. It will be a highlight of your climbing life; but don’t play poker with him! Thank you Alan for another great interview!